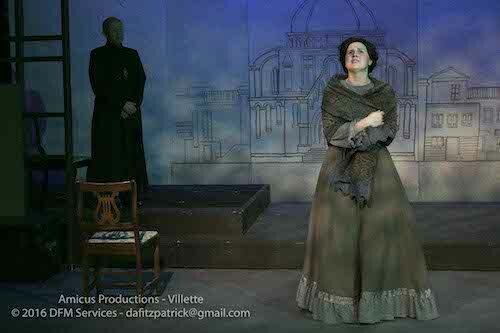 Villette, presented by Amicus Productions, is a tribute to the 200-year anniversary of Charlotte Brontë’s birth, written specifically for Amicus Productions by frequent collaborator Chris Coculuzzi. I applaud the company’s investment in the piece and the community environment it creates. The show in itself, however, was not as enjoyable as the clear enthusiasm and dedication inspiring it. The story is based off of Charlotte Brontë’s novel of the same name, and is told by an elderly Lucy Snowe as she looks back on the course of her life from childhood to adulthood. Paulette St-Amour plays the older Lucy, and does an admirable job of playing a classic narrator with a gentle voice that doesn’t overpower the action, though it does sometimes get lost in the busy stage. She also has an impassioned final monologue, which I thoroughly enjoyed. One problem that was quickly evident was the old trap of thinking that doing a period piece means the characters must always be stiff, formal, and as devoid of emotion as much as possible. Due to this, most of the actors seemed more like they were reciting a script than actually talking with one another. Especially guilty of this was the main Lucy Snowe, played by Janice Pierce. I do understand that her character is explicitly described as being cold and closed off, and that her demeanour was meant to illustrate her as such. Once or twice she shone through, such as when Lucy performs eloquently in a play and proves herself human. This said, I think there were missed opportunities for her to reveal herself as a relatable and somewhat emotional being. It’s hard to cheer for a heroine who seems to passively accept, if not actively seek, the misfortune she encounters. There were notable exceptions to this, actors who made their characters full of subtlety and wit. The young Aviv Cohen, who played Polly, a slightly pretentious but charming young companion of Lucy’s, drew my attention whenever she appeared on stage. Madame Beck and Mr. Paul (Renee Cullen and Chris Coculuzzi), Lucy’s fellow teachers in her adulthood, made a good comedic duo when onstage together, and were always interesting in their motives and actions when they became the center of attention individually. The script of Villette seemed to be trying to stay as true to the book as possible, with a lot of narrative language. While I admire the attention to the original source, the script could have used more dialogue and fewer monologues. As it was, I found it hard to focus and decipher the huge chunks of one-person text, and would have loved to see more interaction between the characters as opposed to them talking at one another. This issue also contributed to a lack of chemistry between the romantic pairs. I was reluctant to buy into the alluded love between Lucy and her various interests without any sort of evidence in the way they talked to or acted around one another. Overall, there is a lot of room for improvement, but with the clear investment of the company and crew, I do believe that Amicus Productions can make strides as they move forward and build upon this experience. I hope they do, as a group of devoted people is a rare and valuable find, and they have clearly assembled one. I look forward to seeing what their combined efforts come up in the future. Tickets are $22, or $20 for students and senior and may be purchased online atwww.amicustickets.ca or by phone at 416-860-6176.